Traditional marketing is defined by carefully crafted and strategically planned marketing campaigns, generally developed months ahead using sales data and analysis, supported by media buys and other collateral. However, the growth in social media use has led marketing to become more time sensitive, forcing marketers to identify and adapt quickly to what is happening at the moment, and leading to the rise in what has been coined “agile marketing”. Agile marketing breaks away from traditional marketing attempts to plan well in advance in more formal and structured processes. Agile marketing strategy is a quick response to real time developments in order for companies to stay relevant and compelling and, most importantly, get people talking. 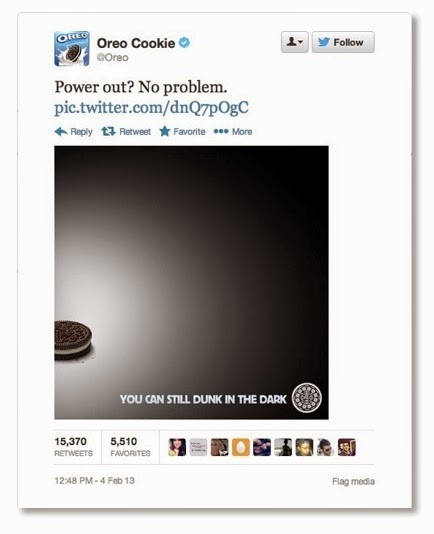 A great example of agile marketing that went viral is the Oreo cookie tweet from Superbowl XLVII. When an unexpected blackout occurred during the game, the Oreo marketing team was quick to tweet a picture of an Oreo in the shadows with the tweet reading: “Power out? No Problem. You can still dunk in the dark”. The tweet probably cost little time and effort to produce, but was more discussed afterwards than any of the much anticipated million-dollar commercials that are historically known to create a buzz during the event. The tweet is a great example of a change in direction for marketing practices. While, “old school” marketing still has its place in overall marketing strategy, smart marketers know that, in order to stay relevant in the fast-paced digital world, you have to be quick on your feet to respond to changes in the marketplace. Agile marketing requires you to pay attention to what’s going on around you, whether it be breaking news, celebrity drama, or just new developments in your company or market. While marketers generally pay close attention to trends and shifts in their own target market, looking beyond this scope to breaking news, tech innovation, or even celebrity drama can help influence agile marketing. But don’t try to force an agile marketing campaign. The best agile marketing seems almost a natural response – funny, creative, and thoughtful. Arby’s came through with a fantastic off-the-cuff response to the infamous Pharrell hat at the Grammys by tweeting, “Hey @Pharrell, can we have our hat back? #GRAMMYs”, referencing the similarity between the style of the hat to Arby’s logo. Quick reactions to an event can sometimes backfire, so it’s important to avoid controversy and stay positive. While thinking on your feet is an important part of agile marketing, you also need to consider the response you may receive in return, so don’t think too quickly! Agile marketing is definitely less successful if you have to backpedal or apologize. Marketing has always been a very creative and forward thinking field. It is an industry that is constantly adapting to changes, and agile marketing is an important part of the development of marketing strategy. By keeping your ear to the ground and paying attention to what’s happening around you, agile marketing can be easily and effectively incorporated into your traditional marketing campaigns.